Vikings anyone? I stinkin’ love the show, so when I saw this graphic novel a few weeks ago, I had to buy it. Prior to that, I did not even know it existed. So, I purchased books 1 & 2 on sale, both published in 2017. Thanks to GR and audio books, I have greatly expanded my reading genres and materials in the last two or so years. I am not sure if I would have read this novel prior to that, but I have in the meantime changed my mind about graphic novels. Since then I have read quite a view different ones ranging from kids to YA and adult genres. One of my favorite graphic novel series thus far is ‘Strangers in Paradise’ and I could not believe how much I was getting into those characters once upon trying the novels! The development of plot and characters reached far and over several years of their lifetime. It was as good and as unforgettable as a great novel. This definitely presented a game changer. This graphic novel was good. The graphics were beautiful, the content was decent, and at 128 pages it was a breeze to read through. And herein lies the problem; length, or the lack there of. If you have seen the show, then you know how Athelstan comes to be part of the Viking village and Ragnar’s complicated relationship to him develops with and understanding of Christianity. 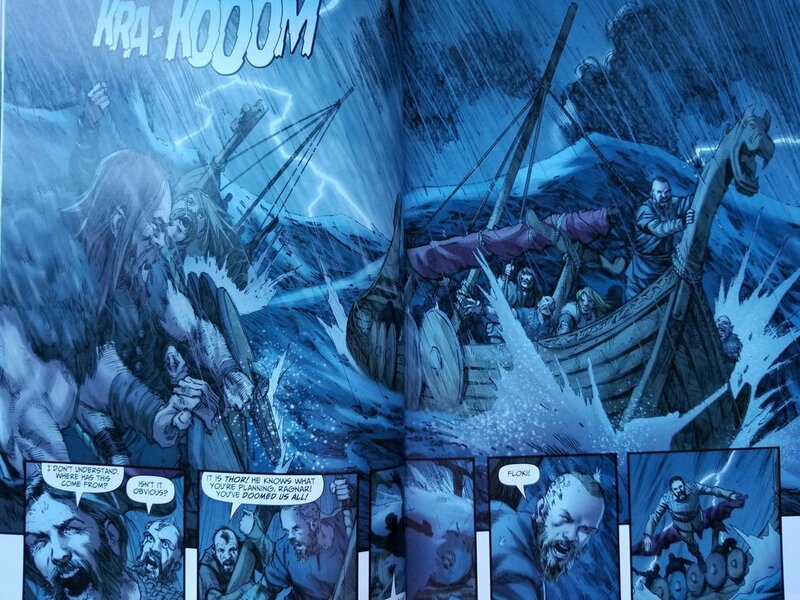 You also learn how this drives a wedge between Floki and Ragnar. This development was basically left out of the novel. 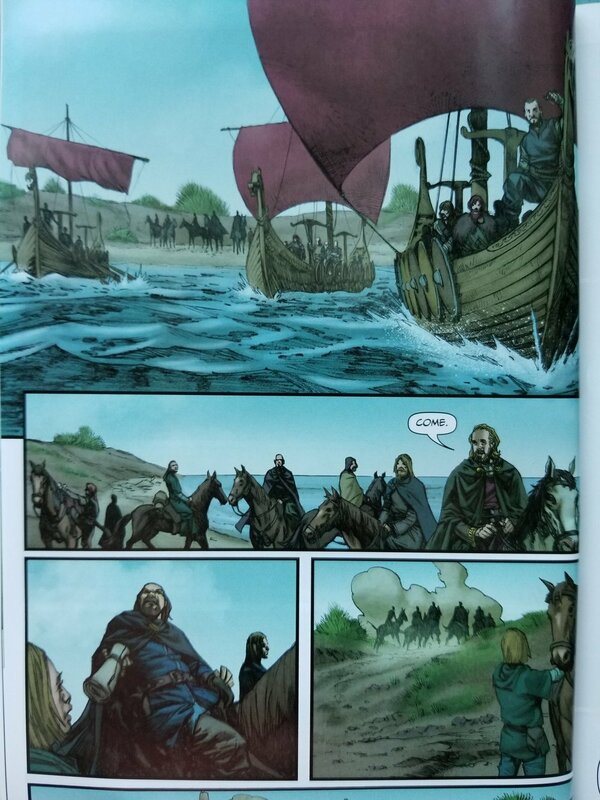 Also, in this book one, Ragnar already is with his second wife, Queen Aslaug and they have their baby and Siggy, who was married to the Earl of Kattegat is already in their village as well, seeking asylum. So, you see where my dilemma lies. I already know too much. The novel started at a different point then the show, and there are many parts that amounted prior to where this graphic novels begins, but that have been left out. Those details are needed to create an overall cohesive plot. At such a short page count, the intricate relationships and character traits simply cannot be reflected and transitions won’t present as smoothly. For me that was missing a bit and I am not sure how it would read to someone that has not seen the show. So why am I rating this 4 stars? Because I am a Vikings Fan! Well, for the things it lacked, it made up with me definitely wanting to re-watch the show. I want these characters back in my life. There are moments that give a glimmer of why I love these beasty characters so much and it served as a refresher or quick run-down. Ultimately, this graphic novel is to love. And if you do…watch the show. It will take it even farther with the back stabs, power struggles, endurance, love triangles etc. Let me know if you have read them. Thoughts?